I discovered (and almost instantly loved) Leon Garfield back in 2015, where I did a round up of some of his books. I most particularly love the strange match between the children's marketing of many of his books with there adult themes, and for the often surprising way he describes things. Recently, I've had another big splurge. The splurge being so big that I am splitting this round up into two parts. As before, I am reviewing these books in the order that I read them rather than order he wrote them. 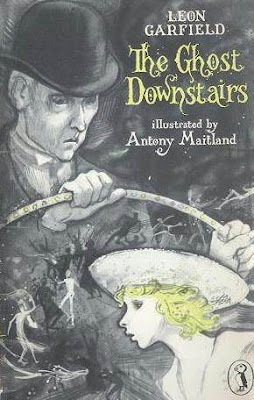 Although ‘The Ghost Downstairs’ is one of Leon Garfield’s shorter books and presented with wonderfully atmospheric illustrations by Antony Maitland (who worked a lot with Garfield), I can’t imagine it’s much of a book for children. Set in the mid 19th century, it tells the story of Mr Fast selling his soul to the devil - sort of. 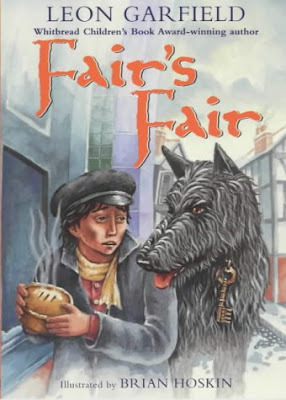 "Two devils lived in Mr Fast: envy and loneliness.” Rather than Garfield’s usual young boy protagonist, Fast is a clerk in a solicitor’s office whose chief pleasure is in drawing airtight contracts that no-one can wriggle out of. This sets him in good stead when the mysterious Mr Fishbane offers to draw up a document that offers him his heart’s desire for a price. Mr Fast calculates that a million pounds would be able to procure him all other desires and in exchange he agrees to pay seven years off his life. The twist is, that he specifies that those seven years should come from the first half of his life, so when he gains his million, he feels that he’s got away scot-free. This isn’t exactly what happens though. So many of his desires, dreams and personality were formed by those first seven years that he has absolutely no idea what he wanted the million pounds for. What’s more, the child of his first seven years is coalescing into the ghostly form of a boy in a sailor suit that he sees following him around. The rest is a succession of creepy stalking and ghostly chases - not that the ghost is chasing him, he is chasing it to find out what desires he has. Within eighty pages, the book comes to an explosive end. Aside from Garfield’s writing, which is consistently at it’s strangest and most interesting, I liked all the reversals in what should have been a pretty normal Faust retelling. The robbing of his childhood was haunting and the notion that he has to stalk the ghost felt fresh and new. The evocation of Victorian London with its smoke and fog, the dome of Saint Paul’s looming in the background added another level of atmosphere and intrigue and the moment where Fast realised what he actually wanted was very poignant. I’d say this is one of Garfield’s best. 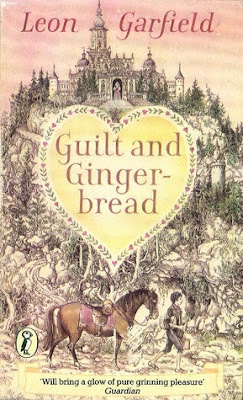 Despite being the adventures of a young eighteenth-century man, ‘Guilt and Gingerbread’ is a bit of an outlier in Leon Garfield’s novels. This is because the book is a fairytale and not a historical novel. It’s also one of the few of his novels that feel specifically child-friendly. It tells the story of Giorgio, a young philosophy student of Padua University who quits because philosophy is a stupid subject (something I wholeheartedly agree). He travels to the small German kingdom of Oberwesselburg to try and win the heart of Charlotte, the ruler. On the way he meets an old lady who gives him a beautiful bridal veil as well as magic scissors and thread. The old lady commands him to bring her the princesses golden heart in return for certainty in marrying her. When there, he finds himself lead to stealing her heart by cutting her chest with the magic scissors, placing another object in there and then sewing her up. This happens three times (of course). The first time he replaces her heart with an apple that makes her jolly and sweet until a maggot inside drives her mad. The second time he replaces the heart with a lamb’s, but it isn’t, it’s a pig’s and it makes her hoggish. The third time he replaces it with a rose, which makes her sweet but she fades as the summer does. Eventually, he replaces her golden heart, throws the witch’s presents in a river and runs away…only to bump into the princess who reveals her love for him. 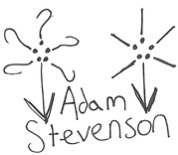 They marry and all live happily ever after. There is left the implication that the princess was also the witch, testing her suitor. There is also a really lovely bit where they describe why they love each other and are completely honest. They list some physical and personality characteristics but conclude they don’t know why - I thought that was a nice touch. This is a well told an interesting fairy tale, charmingly illustrated by Fritz Wegner but I wasn’t as engaged as I am by his more usual stuff. A better Leon Garfield take on a fairy tale is ‘The Wedding Ghost’, which is a very strange, chilling retelling of ‘Sleeping Beauty’. 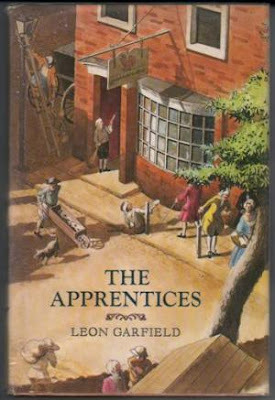 ‘The Apprentices’ is a sequence of twelve stand-alone short stories which have loose links where characters from some of the stories turn up in others. Each of the main characters is an apprentice of some kind. Garfield has, in the past, created stories about all sorts of settings and jobs that I’ve rarely seen tackled anywhere else. Novels include a depiction of the life of a coach driver, the running of a pleasure garden and a number of journeys with traveling players. ‘The Apprentices’ adds lamplighters, funeral directors, midwives, printer’s devils and all number of other jobs. Garfield is his usually unusual self - I only had my notepad for some later stories but I noted a description of one apprentice where it say that ‘when God made him, he must have had his elbow jogged.’ I also enjoyed chemists regarding their patron saint as ‘Thomas, who thrust his scientific fingers into the wounds of Christ’. Many of the stories have a strange, slightly religious base with references to the nativity, the devil and songs of angels. Some of these stories lean more heavily on the unnerving than others but as a whole, it’s subtle and makes the whole sequence feel slightly askew as if more is happening than first appears. The first story is one of the strangest. A lamplighter gains an apprentice called Possul (Apostle) who serves as a linkboy, lighting people home for money. The lamplighter regard his duty to bring light as a religious duty (even if he is not very good at his job) and Possul carries on this idea. Possul is a strange boy, rarely speaking and of ghostly paleness, who, when he lights people home happens to show them the terrors of London’s night. He appears as a light in the darkness in a number of the stories and even inspires a novel in a later story called ‘Thine is the Kingdom’. That novel appears in my favourite story, ‘Tom Titmarsh’s Devil’. It’s a love story between a wild girl who works for a printshop and the more guarded apprentice of a bookseller. She brings ‘Thine is the Kingdom’ to the bookseller to commission. It’s a nightmarish trip through London, inspired by one of Possul’s journeys and ends up criticising the church’s ignorance of the evils outside. When this book is condemned to be burnt, the bookseller’s apprentice tricks the illiterate hangman into burning a different book instead. This was my favourite as I loved the character of the printer’s devil and the terrifying nightmare. Each story was different, with a different set of characters, a different way of telling the story and a different tone. Though some were better than others, it doesn’t suffer from the problem of most short story collections where some are far better than others - each is enjoyable on its on it’s own terms. I completely recommend this collection as an engaging and unique work told with Garfield’s usual style and quality. I did wonder, however, what it is about bird names in the book - there were people called Larkins, Swallows, Starling, Hobby, Hawkins, Parrot, Falconer, Linnet, Nightingale, Titmarsh and many more. This is another of Garfield’s rare excursions into writing a children’s book definitely written for children. It’s also one of his books that drifts into the nineteenth century and the area of fairytale. It’s about Jackson, a homeless orphan who shares a warm pie with a large, threatening dog. The dog has a key around his neck so Jackson follows the dog to its home. It’s an empty mansion with another orphan called Lollipolly, who find food being left every day for them. There’s a twist ending but it’s pretty clear. Despite its simple story and far simpler telling, Leon still knocks a few stylistic balls out the park. Snowflakes are described as ‘fighting in the wind’ and the steam of Jackson’s warm pie is described as not ‘being his soul going to heaven’. It’s also the only Leon Garfield book I can think of that is told in the present tense. This isn’t vital Garfield but it’s a nice little curiosity in his work. - Also, I've been reading it with some children who aren't so into reading, and they've been loving it. Next time will be Bostock and Harris and The December Rose and I will eventually get round to reviewing his completion of The Mystery of Edwin Drood, which I am greatly enjoying. Coming up will also be a Dr Johnson Reading Circle discussion of Boswell and Johnson's Scottish books as well as a review of the double-bill plays about Hogarth currently playing in Kingston Upon Thames.